Solid brass rods. Countless applications for hobbyists and professionals alike. Shorter length great for shallow walls. White color blends with white walls. Non-conducive/non-corroding nylon. Maximum fixture thickness: 3/4". #6 x 1-1/4"sheet metal screw. Accommodates loads up to 50 lbs. Drills directly into drywall.Installs quickly and easily with a #2 Phillips or cordless screwdriver; removable and reusable. Applications: Smoke detectors, clocks, bathroom accessories, thermostats, plaques and awards, decorative wall hangings, picture frames, coat racks. Solid brass rods. Countless applications for hobbyists and professionals alike. For axles, garden furniture, plant stakes, and tent pegs. Single Sheave, Fixed Eye Pulley. Single wheel. Zinc die cast. Starts easier than other self-drilling drywall anchors. No pre-drilling required; can accommodate #6-#8 diameter screws of any length. Up to 50lb load capacity. Drills directly into drywall or wood studs. Zinc die cast design for maximum durability. A superior alternative to traditional plastic plugs and mollies. Installs quickly and easily with a #2 Phillips or cordless screwdriver. #7 x 1-1/4" sheet metal screw; Maximum fixture thickness: 3/4". Removable. Applications: Closet organizers, Electrical fixtures, Curtain rods, HVAC Fixtures, Plumbing fixtures, Light shelving and supports, Signs. Single Sheave, Fixed Eye Pulley. Single wheel. Zinc die cast. Single wheel. Zinc die cast. Single Sheave, Fixed Eye Pulley. Designed for quick, safe, secure fastening for a variety of jobs in poured concrete, brick, cinder block/masonry. Provides self-threading action/maximum holding power for fastening conduit clips; junction boxes; wall partitions/insulation; window/door frames; gutters/roof flashing; shelving; cabinets; furring strips; expansion joints; stud track; duck strap; joist hangers/signs. Pre-assembled unit. Three head styles of screws available. Sizes available: from 1/8'' Extra Short to 1/4'' Extra Long Pre-assembled unit. Three head styles of screws available. Sizes available: from 1/8'' Extra Short to 1/4'' Extra Long Designed for quick, safe, secure fastening for a variety of jobs in poured concrete, brick, cinder block/masonry. Provides self-threading action/maximum holding power for fastening conduit clips; junction boxes; wall partitions/insulation; window/door frames; gutters/roof flashing; shelving; cabinets; furring strips; expansion joints; stud track; duck strap; joist hangers/signs. K & S Round Rod, 3/16 in Diameter, 12 in Overall Length, Stainless Steel Pre-assembled unit. Three head styles of screws available. 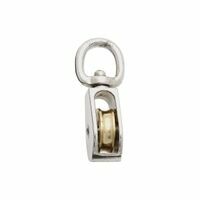 Sizes available: from 1/8'' Extra Short to 1/4'' Extra Long Single Sheave, Fixed Eye Pulley. Includes (10) push pins, (50) thumb tacks and (15) paper clips. Used for garden furniture, plant stakes, tent pegs and axles. Bolts include (22) 6 x 3/4", (10) 8 x 1/2", (5) 8 x 5/8", (7) 10 x 1/2", (3) 10 x 1-1/4" and (3) 1/4 x 1/2". Nuts include (22) M3, (15) M4, (10) M5 and (3) M6. Solid brass rods. Countless applications for hobbyists and professionals alike. 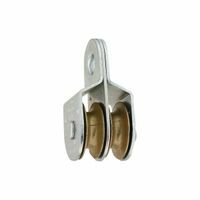 Baron Rope Pulley, Series: C-0178ZD, Single Sheave, Swivel Eye, 1/2 in Sheave Width, Zinc Die-Cast, Nickel-Plated, 5/32 in Rope Dia Simply taps into drywall, no pre-drilling, vibration resistant. For axles, garden furniture, plant stakes, and tent pegs. Includes (40) 4 x 1/2", (28) 6 x 1/2", (20) 5 x 5/8", (5) 8 x 1" and (2) 10 x 1-1/4". Set includes: (30) 4 x 1/2", (25) 6 x 1/2", (15) 6 x 3/4", (10) 8 x 3/4", (10) 8 x 1" and (5) 10 x 1". Includes (13) 8 x 1" and (17) 6 x 1"sheet metal screws and (13) E6 and (17) E5 anchors. Designed for quick, safe, secure fastening for a variety of jobs in poured concrete, brick, cinder block/masonry. Provides self-threading action/maximum holding power for fastening conduit clips; junction boxes; wall partitions/insulation; window/door frames; gutters/roof flashing; shelving; cabinets; furring strips; expansion joints; stud track; duck strap; joist hangers/signs. Single Sheave, Fixed Eye Pulley. Can be used in all types of masonry. Corrosion resistant. It is internally threaded and installs flush to surface. Designed for maximum holding power. Made of high grade steel with special corrosion resistant coating. Bonus: Drill bit included in 10 piece packs. ACQ compatible. Fine centered point that helps guide the anchor into the wall with flawless precision. Sharp cutting edge reduces force required to cut the material, making it a self-drilling anchor without pre-drilling. Also, a sharp profile thread cuts deeply into the hole to ensure maximum holding power and stability. Available in nylon or zinc. 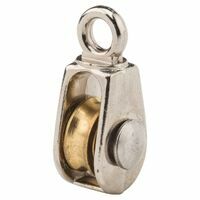 National Hardware Single Pulley, Fixed, Series: 3203BC, 3/16 in Maximum Cable, 25 lb Load Capacity, 3/4 in Sheave Width, Swivel Eye Connection, Fasteners: Specialty Bolt, Die Cast, Brass Sheave, Nickel Plated, Gray, For Rope or Cord for Indoor and Outdoor Applications National Hardware Single Pulley, Fixed, Series: 3203BC, 3/16 in Maximum Cable, 15 lb Load Capacity, Swivel Eye Connection, Fasteners: Chain/Rope Accessory, Die Cast, Brass Sheave, Nickel Plated, Gray, For Rope or Cord for Indoor and Outdoor Applications Used for garden furniture, plant stakes, tent pegs and axles. Hillman Nail Kit, Assorted, 119 Pieces Designed for quick, safe, secure fastening for a variety of jobs in poured concrete, brick, cinder block/masonry. Provides self-threading action/maximum holding power for fastening conduit clips; junction boxes; wall partitions/insulation; window/door frames; gutters/roof flashing; shelving; cabinets; furring strips; expansion joints; stud track; duck strap; joist hangers/signs. Corrosion resistant. It is internally threaded and it installs flush to surface. Used for garden furniture, plant stakes, tent pegs and axles. Superior holding power, 2 expandable wings that grip tightly behind drywall, 2 lateral wings hold the anchor in place, plus drill bits. Cam action expands inside drywall while inserted. Superior holding power, 2 expandable wings that grip tightly behind drywall, 2 lateral wings hold the anchor in place, plus drill bits. Cam action expands inside drywall while inserted. Notched wings prevent rotation in wall. Used for garden furniture, plant stakes, tent pegs and axles. Single wheel. Zinc die cast. Superior holding power, 2 expandable wings that grip tightly behind drywall, 2 lateral wings hold the anchor in place, plus drill bits. Cam action expands inside drywall while inserted. Notched wings prevent rotation in wall. For axles, garden furniture, plant stakes, and tent pegs. Corrosion resistant. It is internally threaded and it installs flush to surface. Used for garden furniture, plant stakes, tent pegs and axles. Used for garden furniture, plant stakes, tent pegs and axles. For axles, garden furniture, plant stakes and tent pegs. 1/16" Thick. Pre-assembled unit. Three head styles of screws available. Sizes available: from 1/8'' Extra Short to 1/4'' Extra Long Notched wings prevent rotation in wall. K & S Round Rod, 1/4 in Diameter, 12 in Overall Length, Stainless Steel Used for garden furniture, plant stakes, tent pegs and axles. Pre-assembled, all-purpose medium duty anchor. One-step installation. Anchor size = hole size. Corrosion resistant. A masonry drill bit is included in all "R" packs of 4 pieces. Designed for quick, safe, secure fastening for a variety of jobs in poured concrete, brick, cinder block/masonry. Provides self-threading action/maximum holding power for fastening conduit clips; junction boxes; wall partitions/insulation; window/door frames; gutters/roof flashing; shelving; cabinets; furring strips; expansion joints; stud track; duck strap; joist hangers/signs. Baron Rope Pulley, Series: C-0173B, Single Sheave, Swivel Eye, 1 in Sheave Width, Solid Bronze, Polished, 5/32 in Rope Dia Fine centered point that helps guide the anchor into the wall with flawless precision. Sharp cutting edge reduces force required to cut the material, making it a self-drilling anchor without pre-drilling. Also, a sharp profile thread cuts deeply into the hole to ensure maximum holding power and stability. Available in nylon or zinc. 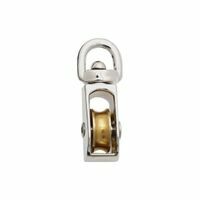 Baron Rope Pulley, Series: C-0173ZD, Single Sheave, Single Wheel, Swivel Eye, 1-1/4 in Sheave Width, 5/8 in Eye Dia, Zinc Die-Cast, Nickel-Plated, 13/32 in Rope Dia Designed for maximum holding power. Made of high grade steel with special corrosion resistant coating. Bonus: Drill bit included in 10 piece packs. ACQ compatible. Steel with die cast sheave. Designed for quick, safe, secure fastening for a variety of jobs in poured concrete, brick, cinder block/masonry. Provides self-threading action/maximum holding power for fastening conduit clips; junction boxes; wall partitions/insulation; window/door frames; gutters/roof flashing; shelving; cabinets; furring strips; expansion joints; stud track; duck strap; joist hangers/signs. Notched wings prevent rotation in wall. Used for garden furniture, plant stakes, tent pegs and axles. Used for garden furniture, plant stakes, tent pegs and axles. Designed for maximum holding power. Made of high grade steel with special corrosion resistant coating. Bonus: Drill bit included in 10 piece packs. ACQ compatible. Including zinc-plated steel Philips screws and poly anchors. Lead free brass waterway. Neatly organized in a divided PVC storage case with chart inside box lid for easy selection. 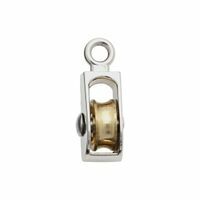 National Hardware Single Pulley, Swivel, Series: 3201BC, 3/16 in Maximum Cable, 9 lb Load Capacity, 1/2 in Sheave Width, Swivel Eye Connection, Fasteners: Chain/Rope Accessory, Die Cast, Brass Sheave, Nickel Plated, Gray, For Rope or Cord for Indoor and Outdoor Applications Used for garden furniture, plant stakes, tent pegs and axles. For axles, garden furniture, plant stakes and tent pegs. Designed for maximum holding power. Made of high grade steel with special corrosion resistant coating. Bonus: Drill bit included in 10 piece packs. ACQ compatible. Fine centered point that helps guide the anchor into the wall with flawless precision. Sharp cutting edge reduces force required to cut the material, making it a self-drilling anchor without pre-drilling. Also, a sharp profile thread cuts deeply into the hole to ensure maximum holding power and stability. Available in nylon or zinc. Maximum rope size 3/16". Designed for use with rope or cord in indoor and outdoor applications. Swivel eye eliminates tangling. Sheave rolls smoothly. Can be rigged as a block and tackle to reduce line pull. Zinc die-cast body with solid brass sheave. K & S Round Rod, 5/16 in Diameter, 12 in Overall Length, Stainless Steel Steel with die cast sheave. Single wheel. Zinc die cast. Fine centered point that helps guide the anchor into the wall with flawless precision. Sharp cutting edge reduces force required to cut the material, making it a self-drilling anchor without pre-drilling. Also, a sharp profile thread cuts deeply into the hole to ensure maximum holding power and stability. Available in nylon or zinc. For axles, garden furniture, plant stakes, and tent pegs. Designed for maximum holding power. Made of high grade steel with special corrosion resistant coating. Bonus: Drill bit included in 10 piece packs. ACQ compatible. Expands and grips tightly behind drywall. Patented design, installs with a screwdriver, no pre-drilling required. For axles, garden furniture, plant stakes and tent pegs. 1/16" Thick. Expands and grips tightly behind drywall. Patented design, installs with a screwdriver, no pre-drilling required. Midwest Conical Anchor, NO 14-16 Thread, 1-1/2 in Anchor, Plastic, With Screw Designed for maximum holding power. Made of high grade steel with special corrosion resistant coating. Bonus: Drill bit included in 10 piece packs. ACQ compatible. Single Sheave, Fixed Eye Pulley. Used for garden furniture, plant stakes, tent pegs and axles. Secure attachment to concrete, block and brick. One piece design requires no assembly, does not require anchor torque-down, cracked and seismic approved. Blue ClimaSeal adds corrosion resistance. ANSI drill bit required. National Hardware Smooth Rod, Series: 4055BC, 3/8 in Diameter, 36 in Height, Cold Rolled Steel, ASTM A510, Plain, For Fencing, Supports, Railing, Sign Posts, Frame Work and Other Industrial Applications For axles, garden furniture, plant stakes, and tent pegs. Secure attachment to concrete, block and brick. One piece design requires no assembly, does not require anchor torque-down, cracked and seismic approved. Blue ClimaSeal adds corrosion resistance. ANSI drill bit required. For axles, garden furniture, plant stakes and tent pegs. Designed for maximum holding power. Made of high grade steel with special corrosion resistant coating. Bonus: Drill bit included in 10 piece packs. ACQ compatible. Used for garden furniture, plant stakes, tent pegs and axles. 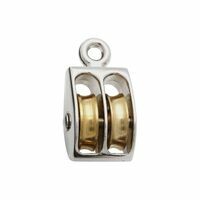 National Hardware Double Pulley, Series: 3201BC, 1/4 in Maximum Cable, 30 lb Load Capacity, 1 in Sheave Width, Swivel Eye Connection, Fasteners: Specialty Bolt, 54.7 in Overall Height, 24.6 in Overall Width, Die Cast, Brass Sheave, Nickel Plated, For Rope or Cord for Indoor and Outdoor Applications Single wheel. Zinc die cast. Fine centered point that helps guide the anchor into the wall with flawless precision. Sharp cutting edge reduces force required to cut the material, making it a self-drilling anchor without pre-drilling. Also, a sharp profile thread cuts deeply into the hole to ensure maximum holding power and stability. Available in nylon or zinc. One-step installation. Anchor size = hole size. Corrosion resistant. Can be installed through fixture. Used for garden furniture, plant stakes, tent pegs and axles. For axles, garden furniture, plant stakes, and tent pegs. Cotter Pin Assortment. Contains 6 popular sizes with a variety of prong lengths. One prong is extended for easy insertion. Neatly organized in a divided PVC storage case with chart inside box lid for easy selection. For axles, garden furniture, plant stakes, and tent pegs. Secure attachment to concrete, block and brick. One piece design requires no assembly, does not require anchor torque-down, cracked and seismic approved. Blue ClimaSeal adds corrosion resistance. ANSI drill bit required. Self-Tapping Wood Screw Assortment. Phillips flat head. Zinc plated carbon steel resists rust and corrosion. Neatly organized in a divided PVC storage case with chart inside box lid for easy selection. Lead free brass waterway. Notched wings prevent rotation in wall. Designed for maximum holding power. Made of high grade steel with special corrosion resistant coating. Socket drive and drill bit are included as a bonus in all packs of 25 and 100 pieces. Parabolically curved for a smoother expansion, it also has a torque controlled expansion and can be installed into a bottomless hole. It is cold formed to increase its strength and has a 360-degree clip for more contact. ICC-ES approved (ESR-3852) for all sizes in cracked and uncracked concrete - all sizes. A masonry drill bit is included in all "R" packs of 4 pieces. Superior holding power, 2 expandable wings that grip tightly behind drywall, 2 lateral wings hold the anchor in place, plus drill bits. Cam action expands inside drywall while inserted. Designed for maximum holding power. Made of high grade steel with special corrosion resistant coating. Socket drive and drill bit are included as a bonus in all packs of 25 and 100 pieces. Midwest Hollow Wall Anchor, NO 8 Anchor, 1-1/4 in Anchor, Zinc Plated, 75 lb Load Capacity, With Screw Midwest Wall Anchor, Medium Duty, Gold Superior holding power, 2 expandable wings that grip tightly behind drywall, 2 lateral wings hold the anchor in place, plus drill bits. Cam action expands inside drywall while inserted. Use to replace broken, lost, or stripped nuts and bolts around the home or workshop. Lead free brass waterway. Neatly organized in a divided PVC storage case with chart inside box lid for easy selection. Parabolically curved for a smoother expansion, it also has a torque controlled expansion and can be installed into a bottomless hole. It is cold formed to increase its strength and has a 360-degree clip for more contact. ICC-ES approved (ESR-3852) for all sizes in cracked and uncracked concrete - all sizes. A masonry drill bit is included in all "R" packs of 4 pieces. Designed for maximum holding power. Made of high grade steel with special corrosion resistant coating. Socket drive and drill bit are included as a bonus in all packs of 25 and 100 pieces. Zinc plated spring steel to resist rust and corrosion, Handy as a quick-release cotter pin substitute. Neatly organized in a divided PVC storage case with chart inside box lid for easy selection. Superior holding power, 2 expandable wings that grip tightly behind drywall, 2 lateral wings hold the anchor in place, plus drill bits. Cam action expands inside drywall while inserted. Parabolically curved for a smoother expansion, it also has a torque controlled expansion and can be installed into a bottomless hole. It is cold formed to increase its strength and has a 360-degree clip for more contact. ICC-ES approved (ESR-3852) for all sizes in cracked and uncracked concrete - all sizes. A masonry drill bit is included in all "R" packs of 4 pieces. For axles, garden furniture, plant stakes and tent pegs. 1/16" Thick. Notched wings prevent rotation in wall. Fine centered point helps guide anchor into wall. A sharp cutting edge, reduces the force required to cut the material. Fast and easy to install. All you need is a screwdriver. Self drilling, strong holding power. For drywall applications only. Hardened steel, diamond point. Designed for quick, secure fastening for a variety of jobs in poured concrete, brick and cinder block/masonry. Diamond point provides self-threading, maximum holding power for fastening conduit clips, furring strips, junction boxes, expansion joints, wall partitions/insulation, stud track, window/door frames, duct strap, gutters, joist hangers, shelves, signs and cabinets. Used for garden furniture, plant stakes, tent pegs and axles. Used for garden furniture, plant stakes, tent pegs and axles. Self-tapping. Zinc plated carbon steel resists rust and corrosion. Neatly organized in a divided PVC storage case with chart inside box lid for easy selection. Lead free brass waterway. Superior holding power, 2 expandable wings that grip tightly behind drywall, 2 lateral wings hold the anchor in place, plus drill bits. Cam action expands inside drywall while inserted. High grade steel, corrosion resistant, high and low thread for ease of installation and maximum holding power. ACQ compatible. One-step installation. Anchor size = hole size. Corrosion resistant. Can be installed through fixture. Hardened steel, diamond point. Designed for quick, secure fastening for a variety of jobs in poured concrete, brick and cinder block/masonry. Diamond point provides self-threading, maximum holding power for fastening conduit clips, furring strips, junction boxes, expansion joints, wall partitions/insulation, stud track, window/door frames, duct strap, gutters, joist hangers, shelves, signs and cabinets. Hardened steel, diamond point. Designed for quick, secure fastening for a variety of jobs in poured concrete, brick and cinder block/masonry. Diamond point provides self-threading, maximum holding power for fastening conduit clips, furring strips, junction boxes, expansion joints, wall partitions/insulation, stud track, window/door frames, duct strap, gutters, joist hangers, shelves, signs and cabinets. For axles, garden furniture, plant stakes and tent pegs. Used for garden furniture, plant stakes, tent pegs and axles. For axles, garden furniture, plant stakes, and tent pegs. Expands and grips tightly behind drywall. Patented design, installs with a screwdriver, no pre-drilling required. Extra Long Cotter Pin Assortment. Made of hardened steel. Zinc plating finish for rust resistance. Neatly organized in a divided PVC storage case with chart inside box lid for easy selection. One-step installation. Anchor size = hole size. Corrosion resistant. Can be installed through fixture. Used for garden furniture, plant stakes, tent pegs and axles. Designed for maximum holding power. Made of high grade steel with special corrosion resistant coating. Socket drive and drill bit are included as a bonus in all packs of 25 and 100 pieces. Used for garden furniture, plant stakes, tent pegs and axles. Fine centered point that helps guide the anchor into the wall with flawless precision. Sharp cutting edge reduces force required to cut the material, making it a self-drilling anchor without pre-drilling. Also, a sharp profile thread cuts deeply into the hole to ensure maximum holding power and stability. Available in nylon or zinc. Hardened steel, diamond point. Designed for quick, secure fastening for a variety of jobs in poured concrete, brick and cinder block/masonry. Diamond point provides self-threading, maximum holding power for fastening conduit clips, furring strips, junction boxes, expansion joints, wall partitions/insulation, stud track, window/door frames, duct strap, gutters, joist hangers, shelves, signs and cabinets. For axles, garden furniture, plant stakes, and tent pegs. Parabolically curved for a smoother expansion, it also has a torque controlled expansion and can be installed into a bottomless hole. It is cold formed to increase its strength and has a 360-degree clip for more contact. ICC-ES approved (ESR-3852) for all sizes in cracked and uncracked concrete - all sizes. A masonry drill bit is included in all "R" packs of 4 pieces. Durable and reusable container with assorted sizes of eye hooks, cup hooks and shoulder hooks. Contains enough items to complete multiple projects. Durable and reusable container with assorted kinds and sizes of screws, bolts, washers and nuts. Durable and reusable container with items such as anchors, toggle bolts with wings, bolts and screws. Contains enough items to complete multiple projects. Durable and reusable container with assorted types and sizes. Contains enough items to complete multiple projects. Single Sheave, Fixed Eye Pulley.